Hello, everyone, we have brought Top 10 Best USB car Charger adapters for you. While driving and traveling many times we face this condition of the low battery or running out of battery. 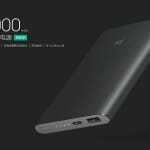 We have already seen top best Portable power banks to buy for outings and traveling here now these are the best adapters to charge those power banks or directly your devices too!. There are many car chargers available in the market but you may be faced that within a few days of use those adapters stops working or does not charge the devices or charges devices very very slowly. Do not worry we have brought the top 10 car charger adapters which are Branded, Compatible with all devices like iPhones, iPads, Android phones, tablets, etc. 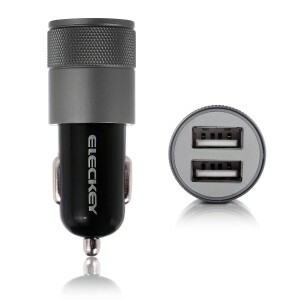 This is Upgrade Version 4.8A Car charger from Eleckey. 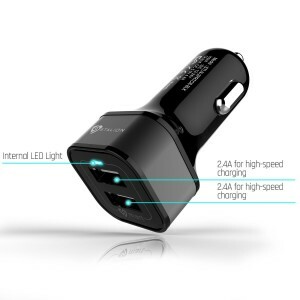 This car charger has a capacity to provide optimal charging efficiency automatically up-to 4.8A, Total. Has protection against overheating, overcurrent, and overcharging. The aukey car charger has The AiPower Adaptive Charging Technology which Detects the input current of the connected devices to maximize both compatibility and charging speed. It can provide up to 2.4 amps each port or 4.8 amps overall. It is most Powerful charger as has 24W / 4.8A total output with two standard USB output ports enables you to charge two tablets or phones with up to 2.4A simultaneously at their full speed. The charger has a sophisticated circuit design for providing safety from over-heated, over-current and over-charging. 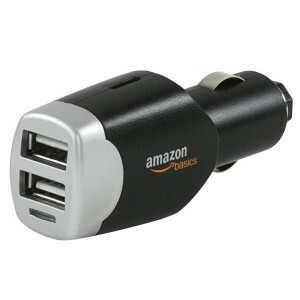 This is most powerful 2 Port Car Charger with the smallest size in the world (1.4 x 0.9 x 0.9 inches ). Aukey gives 18 Month Worry-Free Warranty. 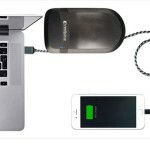 This car charger is a Compact, simple design and lightweight. TechMatte car charger provides High-Speed 2.1A current and is also compatible with all kind of devices. This charger has two 2.4Amp (4.8Amp Total) USB outputs which can charge up to 2 devices. Also, this charger charges most Apple accessories at a maximum speed such as the iPad and all models of the iPhone. Spigen Car Charger has Fast Charging which allows you to charge your device quicker than conventional chargers at optimal efficiency. Built-in charging circuitry has full protection for devices from any short-circuiting, over-heating, over-charging, and over-currents. USB Car Charger has provided Blue LED light to indicate when the charger is operational. 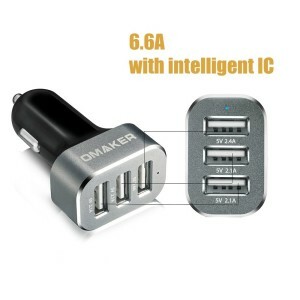 This is an upgrade version of Omaker car charger and features 3 Port 6.6A / 33W USB which can simultaneously charge any 3 devices like tablet or smartphone at full speed. Has Intelligent technology equipped on all 3 ports to identify each attached device and provide the highest optimum recharging power that the devices can adapt to. Its Intelligent circuit design provides protection against over-heating, over-currents, overcharging and short circuit. Also, smart tech stops charging when the battery is full. A very soft Internal LED power indicator is provided the LED indicator helps to know connection status and doesn’t distract you while driving. Certified by RoHS, CE & FCC; High-quality fireproof material & anti-oxidation aluminum pull tab; No radio loss in your car or effect to Bluetooth or Wi-Fi devices. With Stalion USB car charger, you can recharge your smartphone, your tablet, your GPS device and your MP3 players all at one time. This car accessories for charging have two USB ports. 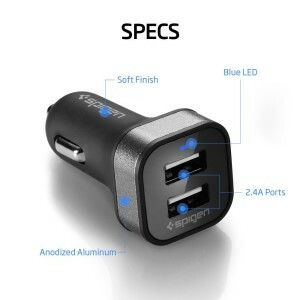 The car charger is designed for all types of devices! You can use it as an Apple iPhone 6 6s Plus, 5 5s 5c, Samsung Galaxy S7 Edge/ S6 Edge+ Plus, S5 S4, Note 5 4 3, for iPads, other smartphones and tablets, GPS units, iPods, MP3 players and more. 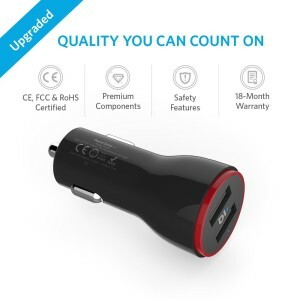 maxboost car charger has a capacity of 24W / 4.8A which charges your favorite mobile devices including the iPad (max speed), iPhone (max speed), iPod, HTC, Galaxy, Blackberry, MP3 Players, Digital Cameras, PDAs, Mobile Phones. 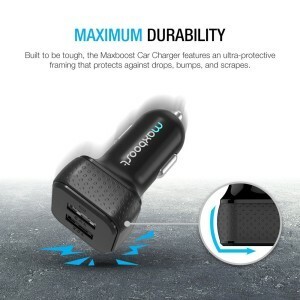 Maxboost car charger has an Intelligent circuit design which protects against short circuiting, over-heating, over-currents, and over-charging. Also, the Charging stops when the battery is full. 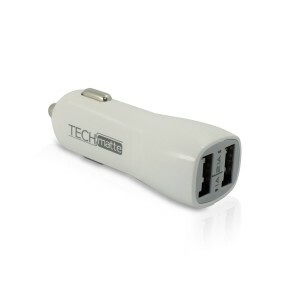 This car charger USB ports quickly and easily identify your mobile devices and provides optimal charging efficiency. This charger has dual USB cable ports, which allows you to charge two tablets, smartphones or other devices simultaneously at full speed while on the road. The car charger is very small and lightweight. It is 12 / 24-volt input so compatible with all standard cigarette-lighter sockets. Super High Speed Charging for Android systems, Apple devices, and all smart phones. The Anker is most trusted brand and 10 million+ devices are powered by “Anker” America’s #1 USB charging brand. It has Fast Charging Technology, the PowerIQ and VoltageBoost are combined to provide the fastest possible charge up to 4.8 amps combined or 2.4 amps from each port. 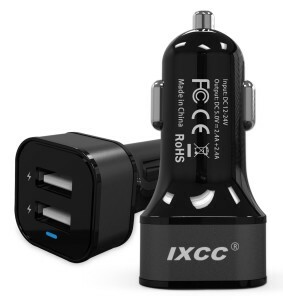 This is a certified car charger and ensures the protection of your devices 12 / 24-volt input voltage. You also get with this Anker PowerDrive 2 (24W 2-port USB car charger) a welcome guide, 18-month warranty, and friendly customer service. Apple MFi Certified Car Charger contains an authorization chip issued by Apple which communicates with any Lightning connector device to ensure 100% Compatibility and no Warning Messages. You can rest assured that it will not break with Apple's firmware updates and it supports latest iOS 9.